In response to the spate of governing cabal looting billions of dollars and laundering this via private jets to South Africa and beyond, the Central Bank of Nigeria, CBN, governed by Godwin Emefiele has again decided that we the people must be punished and deprived of all rights to receive and send our hard earned personal little money for the little business and living necessities we manage. In an unbelievable but expected new move, the CBN sent the below letter to us with the latest restrictions on our financial freedom. 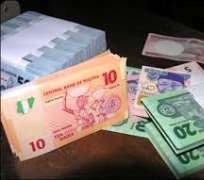 The Central Bank of Nigeria (CBN) has in its circular dated 17th April, 2015 condemned the rising trend of currency substitution and dollarization of the economy. Deposit Money Banks operating in Nigeria have been advised to desist from the collection of foreign currencies for payment of domestic transactions on behalf of their customers and the use of their customers’ domiciliary accounts for making payments for visible and invisible transactions (fees, charges, licenses e.t.c) originating and consummated in Nigeria. In compliance with this directive, you will be required to provide supporting documentation for all payments to and from your domiciliary accounts as proof that payments are not in breach of this directive. Please note that this applies to payments to or from entities/individuals within Nigeria. Foreigners, visitors and tourists to Nigeria are allowed to continue to use their cards for payments or exchange their foreign currency for local currency at any of the authorised dealers’ outposts including hotels. Thank you for banking with Standard Chartered Bank. As always, we remain committed to providing you best-in-class financial solutions. As with the other new policy revisions, there was no prior warning. The notice was sent to take effect immediately. With this new restriction we must explain every penny our family and friends in America wire to us to help them build their houses in Nigeria or to simply save or invest for them in Nigeria; or to pay school fees of their wife and girl friends. We must explain and defend WITH “PROOF” [supporting documentation] every dollar we wish to send to friends and loved ones abroad or that we receive. This does not happen anywhere in the world. They have forced all our cash into the bank in the cash-less imprisonment system only seen in Nigeria and never seen in any developed nation and now they want to give the banker-cabal the right to pry into our every business and seize our little money at will. But how about those who carted $15 million in suitcases in private jets to South Africa? How about those wives of governors caught in Bayelsa in 2006 laundering millions? How about the cabal given all types of concessions, intervention funds, with billions of dollars import waivers [ N234 billion waivers to PHCN in 2013 only ], and never monitored? We mentioned in our alert just this week [ENDS.ng: CBN Governor Mr. Godwin Emefiele Drives Nigerians Like Slaves ] that the CBN under Godwin Emefiele had decided with no warning to suddenly decrease to one-third the forex withdrawal limit and forex purchase limit of our naira cards; on a day notice decreased to $300/day and $50,000 per year. Customers pay N10-50 per sms alert, even for bank error repeat texts; though bulk sms texts are offered to businesses by mobile networks at N1/sms. First Bank and Keystone Bank even have a N100 monthly ATM card maintenance fee! Even reference letters are fulfilled at a charge of up to N2000 ($12). Compare this to America for instance, where banks do not make money on COT, deposits or withdrawals and most of these additional bank services are offered for free to customers. We have been proven correct. There is no one ot defend the interests of the masses against these monsters. Godwin meets with bankers and they rise from meetings with new insane and never before seen on the planet, decisions to restrict our freedom and we are never consulted or represented. Without allowing us adjust to one deprivation and limitation, they add another and another on it. Even communist China is better to its people than these vile, vicious vampires in this kakistocratic republic. As Godwin’s tenure comes to an end, he is in a hurry to raise the prison walls and build a moat around it so we the 100 million destitute Nigerian masses living under a dollar a day, and millions other poor and managing small businesses will never see the light of financial stability and opportunities and the little happiness we pursue. Because new technology and the expected new Integrity government is anticipated to further inhibit the looting of the Nigerian oil wealth, the thieves who all now own one big corporation or the other in Nigeria are finalizing their systems of stealing from the incapacitated and imprisoned slave masses. One day we will eat them.